Although the tomato has a relatively brief history in western culture, it has had an incredible impact. Itâ&#x20AC;&#x2122;s one of the most commonly used fruits in the kitchen, yet many of its stories and questions go unrecognized. In the beginning... Long ago in South America the Mayans introduced the Aztecs to the tomato which they incorporated into their diets and recipes eagerly because of its similarity to the beet tomato, a staple of their diet. They created salsa using juiced tomatoes, pumpkin seeds, and chili peppers. The Spanish arrived and conquered the Aztecs. In 1519, under the command of Cortez, the conquistadiors became the first Europeans in recorded history to come into contact with the tomato. Was It always red? The earliest known european description of the tomato comes from Italy, 1544, and describes the fruit as ‘pomodoro’, or ‘golden apple’, indicating that the first tomatoes brought from South America to Europe may have been yellow. Research is inconclusive as to whether or not the tomato brought back to America by the Europeans was a red European breed or found red in South America. For a time, there was a perception that tomatoes were poisonous, partially stemming from the tomatoesâ&#x20AC;&#x2122; relationship with deadly nightshade, and possiby stemming from a reaction that occurs when acidic tomato juice reacts with the surface of pewter dinnerware and releases poisonous lead trapped inside. Past misconceptions about tomatoes being poisonous may have also stemmed from the stem. More specifically, they may have stemmed from the toxic chemical known as tomatine which can be found in the stem and leaves of the tomato plant, as well as the unripe fruit. After the civil war, thousands of Italians immigrated to the United States, bringing their tomato-based recipes with them. Pizza parlors were introduced to America in the early twentieth century, and pizza soon became the most popular food in the United States, in no small part due to the tomato sauce. The history of the pronunciation of words like “tomato” is long and needlessly complicated. Americans typically say “tomayto” while the English prefer “tomahto”, although either pronunciation is acceptable in either country. While scientifically classified as a fruit, the tomato was declared a vegetable by the supreme court in 1893 for import taxation purposes. No import taxes were imposed on fruits at the time, but vegetables were subject to an duty of 10 percent. Next time you hear someone call the tomato a vegetable, donâ&#x20AC;&#x2122;t correct them. You may go to jail. A MODERN MARVEL? In 1834. 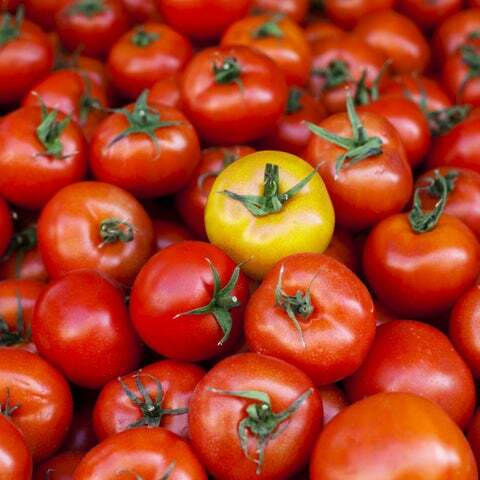 Dr John C. Bennett published a study in America that claimed that the tomato could cure practically any ailment. This started a nationwide trend of tomato-related hype where the tomato was treated as a miracle fruit, not unlike the way electricity was treated at the dawn of print advertisement. The hype wore out soon enough, but the tomato had become firmly rooted in American culture. THE FISHY ORIGIN OF KETCHUP Ketchup originated from a Chinese fish sauce called “ke-tsiap” . Tomato was added and fish was removed when the sauce was adapted into the American diet. Directions In a 6-quart stockpot or Dutch oven, heat oil, butter and pepper flakes over medium heat until butter is melted. Add carrots and onion; cook, uncovered, over medium heat, stirring frequently, until vegetables are softened, 8-10 minutes. Add garlic and dried basil; cook and stir 1 minute longer. Stir in tomatoes, chicken stock, tomato paste, sugar, salt and pepper; stir well. Bring to a boil. Reduce heat; simmer, uncovered, to let flavors blend, 2025 minutes. Remove pan from heat. Using a blender, puree soup in batches until smooth. If desired, slowly stir in heavy cream, stirring continuously to incorporate; return to stove to heat through. If desired, top with fresh basil.